Sometimes I come up with good ideas for adventures and sometimes I come up with less good ideas. But I hate to call many of them, even if they go badly off script, bad ideas. One idea that went somewhat bad this year was taking a two seater inflatable kayak into the Minam River so Jeff and I could fish our way back to the Minam Store. In an effort to learn the Minam well this year, I thought a great way to do it would be by fishing from a boat . . . kind of like we do on the Wallowa and the Grande Ronde. One person rows while the other fishes. You can cover a lot of ground this way, rise a lot of fish, and frankly catch a lot of fish without putting out too much effort. For the Wallowa and Grande Ronde we simply put one of our 13’ fishing frame rafts in at a put-in and go to fishing. This is the best way to fish the rivers while the water is high. The Minam adds some difficulty though. You cannot haul a raft to a put in on the Minam River because there are no public roads on it. There is however a timber company road on the lower end that is open to non-motorized public use. The solution was our two seater inflatable kayak strapped to a kayak dolly. Mid July is usually hot, sometimes damn hot in eastern Oregon. This year was no exception. Jeff and I headed over to the Minam mid afternoon with temperatures somewhere between 90 and 100 degrees. I took no waders, “Wet wading will feel good in this heat.” I said. Jeff, always a little more cautious, took his waders just in case. On the drive over Jeff began to notice some dark clouds in his rearview mirror. I kept dismissing them by saying “Oh, that will blow over in 15 minutes.” We even picked up a six pack of light beer on the way over to quell the heat once we were on the river. At Minam we strapped the 2 seater kayak onto the dolly and put the whole contraption on top of Jeff’s minivan. Lottie, my wife, drove Jeff and I up to the gate and the entrance to the timber company ground. It began to rain a little. We headed down the road (it was going to be about a 2.5 mile walk) and my wife drove back to the store. 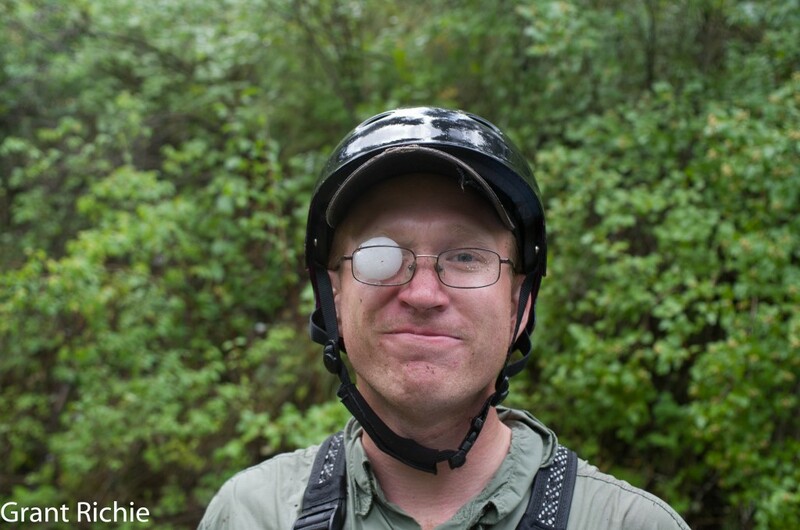 Jeff and I got about a hundred yards or so down the logging road before it started raining hard. I paused under a tree and said “Shall we sit here for 15 minutes and let it pass?” Jeff moved under the cover of the tree and began to feel wise about bringing his waders. I began to feel less wise about not bringing mine. I had already worked a full day, sweating hard nailing down hardwood floors, so the change in temperatures felt good. Jeff and I opened up one of our beers for the wait. Then some pea sized hail began to fall. “What the . . . HAIL!” And the hail grew in size and frequency. Now there were ice balls the size of marbles coming down. Jeff and I quickly grabbed our lifejackets and helmets out of the kayak and put them on for protection. We moved closer to the trunk of the tree seeking protection under the overhanging bows. The bows were soon no match for the hail as it approached and passed golf ball size. At first it was funny. We both began to laugh as we huddled closer and closer together nearly hugging the tree beside the logging road. But then it began to hurt as it hit exposed shoulders and elbows. I am sure we were quite a sight; two grown men nearly hugging each other and a tree on a logging road in the middle of eastern Oregon. The hail weakened and we had to get some pictures for proof. I didn’t want to be accused of telling fish stories. Once to the river, the water that would have felt good earlier in the day now felt less good. Dumping huge amounts of ice into the river does a quick job of making the water cold. Our original plan was to take turns rowing and fishing, stopping at the best spots to work over more thoroughly. I, without my waders, was cold though and I volunteered to paddle the whole way to keep a little warmer. Jeff rose and caught quite a few rainbows, but we did not stop. I am not sure how fish react to a sudden and drastic change in water temperature, but the fishing did not seem too bad but not too great either. 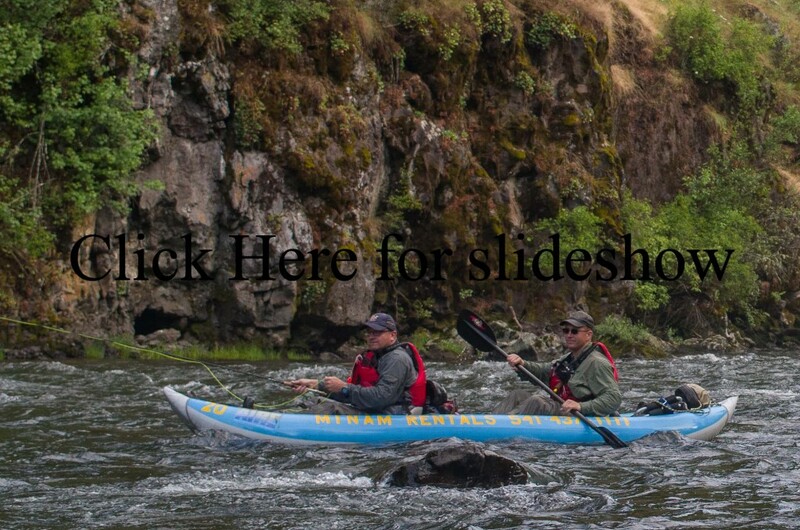 Click the picture below to see more and shoot me an email to grant@minamraftrentals.com for information about our guided trips on the Wallowa and Grande Ronde. Or visit our guided trips page here.